I actually made two soda breads this month. Every March I dream of what soda bread riff I want to do. This year I added blood orange juice and zest, cloves, cinnamon, 65% cacao chocolate chunks, a dose of Grand Marnier, and instead of cow’s milk yogurt I think I used goat’s. The juice added to the yogurt made the dough faintly pink, which I thought was hilarious, and was sorry to see the color kind of fade in the oven. But it was a winner. That’s it above. I pulled pieces off and munched on them warm. Then for my sister’s birthday I made another soda bread and added unsweetened coconut flakes, 72% cacao chocolate, and a few glugs of Malibu. It was basically a boozy Mounds bar tucked inside some bread. An unorthodox birthday cake. She was a fan. Today I made a pizza I’ve been wanting to recreate since 2008, when I visited Mo’orea, an island off Tahiti. The shack on the side of the road is called Allo Pizza. Mo’orean locals are generally French speakers and French food eaters with a healthy hunger for fish and their lovely tropical produce. It’s not a combination that calls to mind pizza, but there it was. I wasn’t a food writer then, not officially, but I kept a journal that documented what we did and what we ate; and praise Jesus, or I wouldn’t remember the toppings on this pie: fresh tuna (they call it ‘lagoon fish,’ caught across the street), capers, anchovies, Parmesan, garlic, and herbes de Provence. It’s an unlikely combination, but so was being halfway around the world and eating on the street while dodging guys doing wheelies on mopeds. We did notice that no one wore gloves while handling the toppings, and that there was no refrigeration for the fish. So only we ate there for lunch, as soon as it opened. And just the same, we waited to get sick, but it never happened. The tuna below was not caught across the street but caught from behind the counter at Whole Foods, a reasonable substitute. It was great fun to make, warming and delicious, wheelies or no wheelies. **Laura Ingalls Wilder’s Pa used to say, ‘When the days begin to lengthen, the cold begins to strengthen.’ I can never remember when I parked at Target, but this I remember. It’s Fall, and come Fall, I start wanting to melt stuff until it’s goopy and eat it with the shades pulled. Chocolate is a big draw, and so is cheese. * I started thinking about grilled cheese sandwiches and issued myself a challenge to come up with new combinations. A half-hour’s trip to Whole Foods provided a beautiful crusty loaf of levain**. They bring in some of their bread from Balthazar, and this was one of them. Pullman shaped, it was perfect for sandwiches. Then I bought two kinds of cheese, and then I went to the farm and picked things. Second! I made Marcella Hazan’s luminous pasta arrabbiata sauce and left out the pasta. It calls for really ripe tomatoes, four cloves of garlic, red pepper flakes, and one hot stuffed cherry pepper. I toasted it up with some oozy Monterey Jack. It was a stunner, and I named it ‘Hot Stuff.’ I think I’ll make it again tomorrow for breakfast. * And sometimes chocolate and cheese together. I once reviewed a fancy-pants macaroni and cheese place that had a French-trained chef, and he made me grilled chocolate and Brie. It was completely out of control. I still dream about it. ** Not for long. With a proper counter and a dishwasher to boot, soon I’ll be rekindling my affair with the yeast stored in my freezer. It could use a spark. I’m one of those irritating tree-huggers who loves every season (at least at the beginning), but Fall and I go way back. Birthday and all. Piles of apples and squash at the farm. There will be cooking, my friends. Lots of it. This is how I get ready. Saigon cinnamon (there is no other), allspice, nutmeg (the whole little guys), cloves, ground ginger, hot red pepper flakes, cardamom, almond extract. 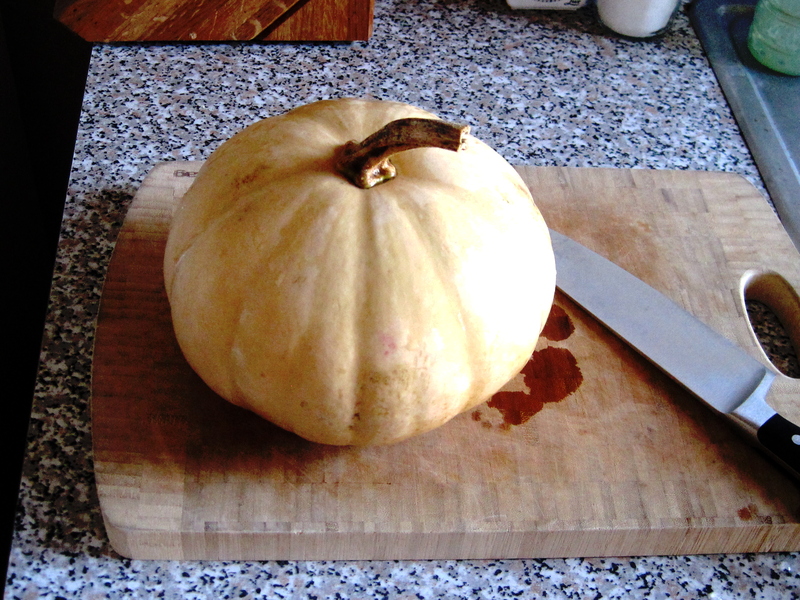 I posted this last year on Facebook with a caption: ‘My pumpkin is going under the knife today. Please keep it in your prayers at this difficult time.’ For all of you who did, thank you. It was delicious. Local apples, grains, all-purpose and whole-wheat pastry flours, Grade B pure maple syrup, almonds, walnuts, crab apple schnapps, bottle of vodka containing vanilla beans at mid-steep (in a couple of months it will be a killer, and far less expensive, extract than the teeny Foodtown bottles). 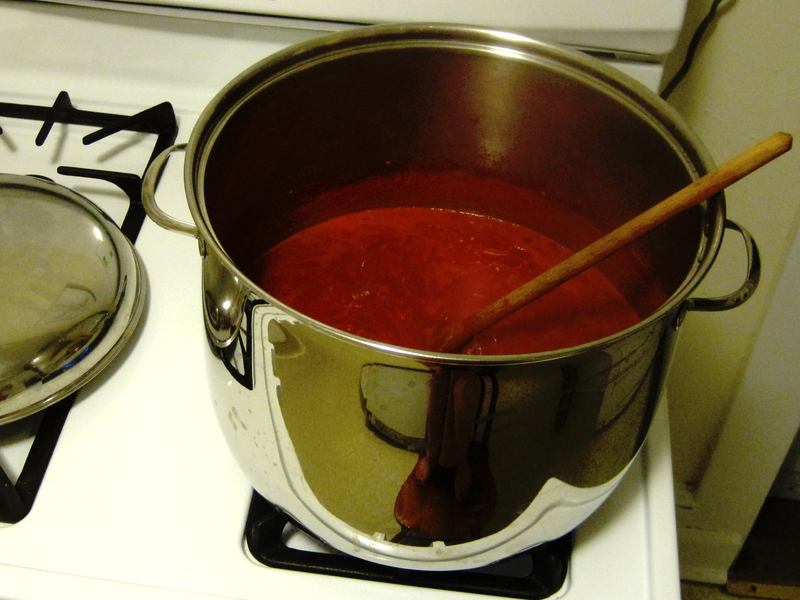 Long-cooking tomato sauce from local, organic plum tomatoes. You can see it has cooked down by an inch—getting richer than Scrooge McDuck. Bread, whatever I baked for breakfast this week, preserves (right now mulberry, on the horizon crab apple), chicken stock, butter, tomato sauce, quince syrup, yeast, bread crumb bag (all of the crusts I don’t eat, blitzed for toppings), Parmigiano-Reggiano. Red quinoa, drying at the farm. Sugars (granulated, confectioner’s, dark brown). 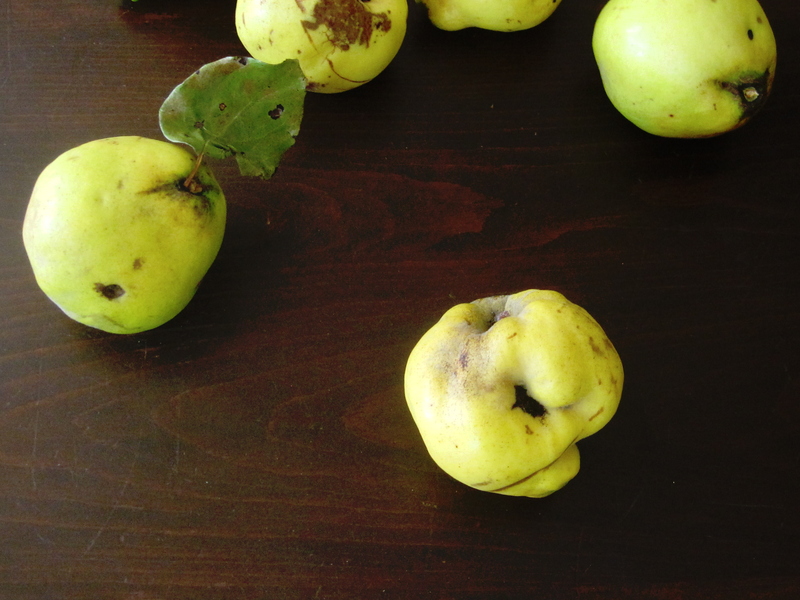 Quinces from a super-secret tree I found last year. Onions, garlic, potatoes. I keep them in a three-divided wooden unit that I found at the antiques shop downtown. This is the coolest spot in my place. It houses winter squash. All kinds. Cheese, Luna, butternut, Cinderella. I line them up on the floor. Cinderella and cheese pumpkins, fantastic for pie. 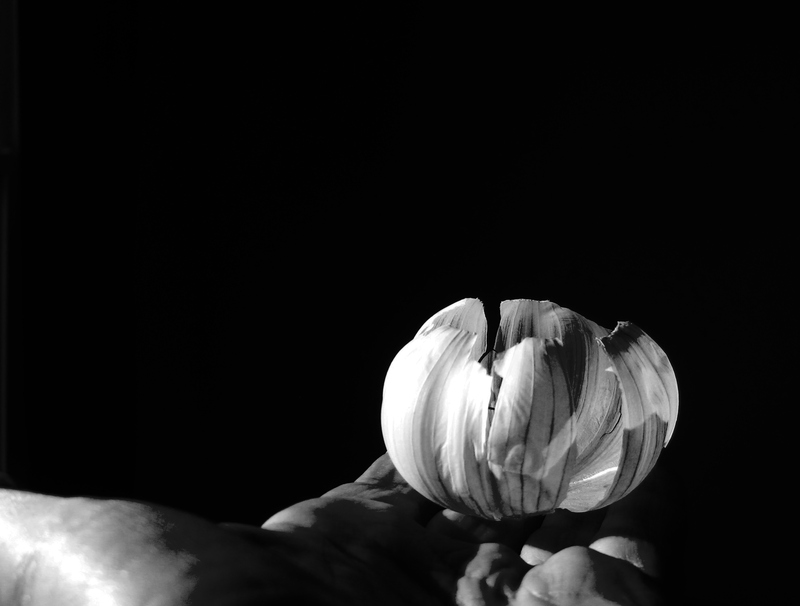 Papery garlic skin, like a lotus flower. As a kid I remember being told, pretty often, that I needed to grow a thicker skin. And as evidenced by my photo file, this issue still hangs over me. Apparently I have a fascination, teetering on obsession, with fruit and vegetable skins, husks, eggshells, peels. The pictures here, seriously? They’re narrowed down from dozens more. Let’s spread this out and discuss. I’ve noticed lately, and this is new, that people buying fresh corn at the store or farm stand want to strip the ears from the husks right then and there. What I don’t think they know is once it’s off the stalk, an ear of corn goes through its own version of The Change: its ethereal sweetness begins to turn to bland starch. What’s more, the silky corn husk has a job: to protect the kernels from the blazing heat of the summer sun and from insects…and to keep its sweetness inside and intact as long as possible. Stripping the ear too soon of its husk accelerates the change to starch. 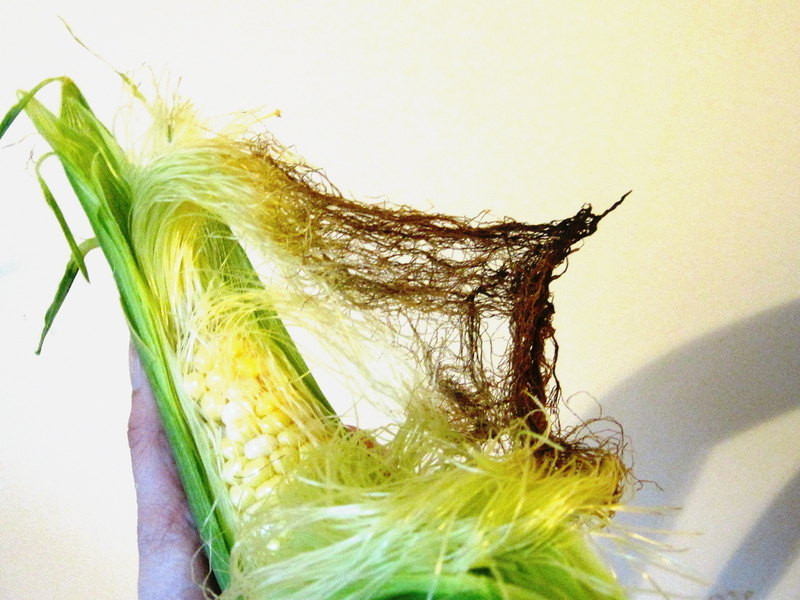 For corn at its tender, authentic best, you want to grab it freshly picked and resist husking until just before cooking. * Tip. Moving on to the lychee above. 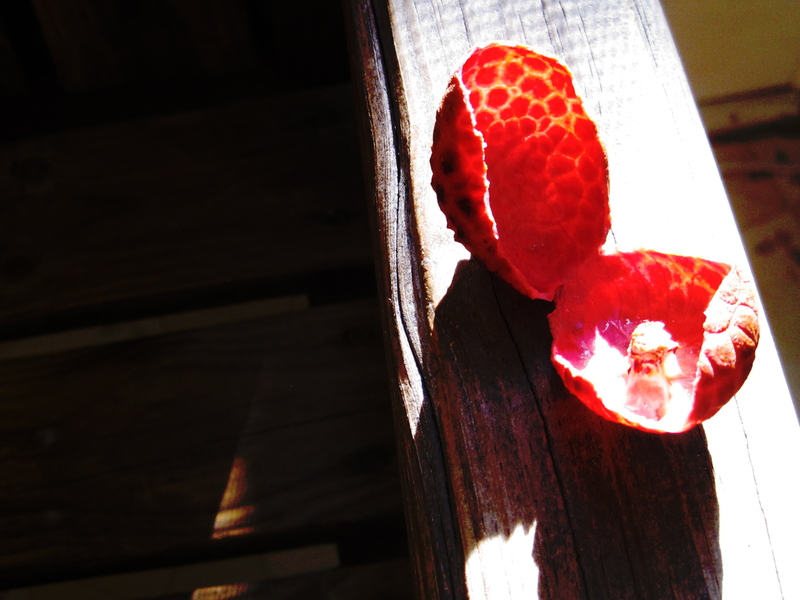 It’s also a hot-weather plant, a tropical fruit. It’s subject to erratic weather—harsh sunlight, drenching rains, and powerful winds, not to mention tropical bugs, which are pretty much legend when it comes to voracity. Yet the lychee’s skin is beautiful—speckled, transparent, and surprisingly dense. When ripe, the fruit is juicy, almost syrupy, like a miniature rum punch without the risk of migraine. That lovely complex skin protects the fruit, allowing it to stay wholly and happily itself until it’s ready to be enjoyed. Last example: the peach, yet another summer-grower. That’s its skin above. When a peach is picked hard enough to break the windshield on my Accord and shipped in from East Jesus Nowhere, it never gets truly ripe. 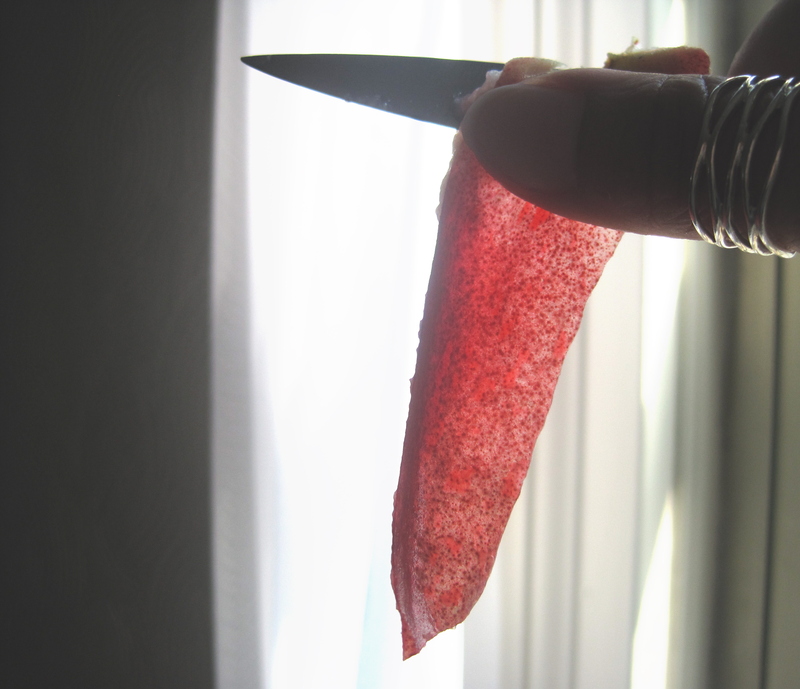 Its skin needs to be sliced off with a sharp paring knife; the fruit knows it’s not ready, and it puts up a fight. People have proper tangible skins, of course. But we also like to talk about having a figurative skin, as I mention way above. It’s that intangible skin that we wrap ourselves in, as a protective barrier, until we’re ready to drop it. It can take a lot to shed that skin. It safeguards our insecurities, our awkward histories, what have you. The fear of exposing vulnerabilities, for most humans, is just one skinny rung down from the fear of the guy with the hoodie and sickle. It takes trust, stones, patience, and a heap of good intuition. Having a thick skin is a good idea. But it’s not something you can just ‘get’, like picking up soup bones at the butcher’s. It has to be real, earned, owned. We’ve all met—or been—people who have pretended to be thick-skinned. It shows. Feigning toughness, bravado—that’s a mask. Underneath we’re just as fragile as those delicate kernels and fruits above. And (this is important) no matter how thick that skin is, even if it’s like the lychee’s, we need to make sure it’s yielding. A solid protective layer is a good thing; heck, I think it’s essential in this nutty world. But it’s not intended to keep us under lock and key. A skin that works for us comes from the inside, despite what the Aveeno ads tell us. It should be constructed in such a way that it can be dropped when we want it dropped, because there will be times when we want to reveal our authentic selves. It should work for us. With people who want to scald you, drench you, peck at you? Stay behind it, safe as the corn and lychee are from the elements and the bugs. With trusted friends? Take it off with confidence, as easily as the ripe peach skin peels away from the fruit. And here’s the cool thing, another version of the semi-colon, symbol of a pause before continuing: You can always reassess, regroup, and move again when you’re ready. So you took off your skin too soon, or for the wrong people, and it wasn’t the best idea. When you happen upon the right time with the right people, the ones who will relish the true, sweet, occasionally but somehow charmingly weird you, you can opt to take it off again. Until then, you can always put it back on and walk away cocky. 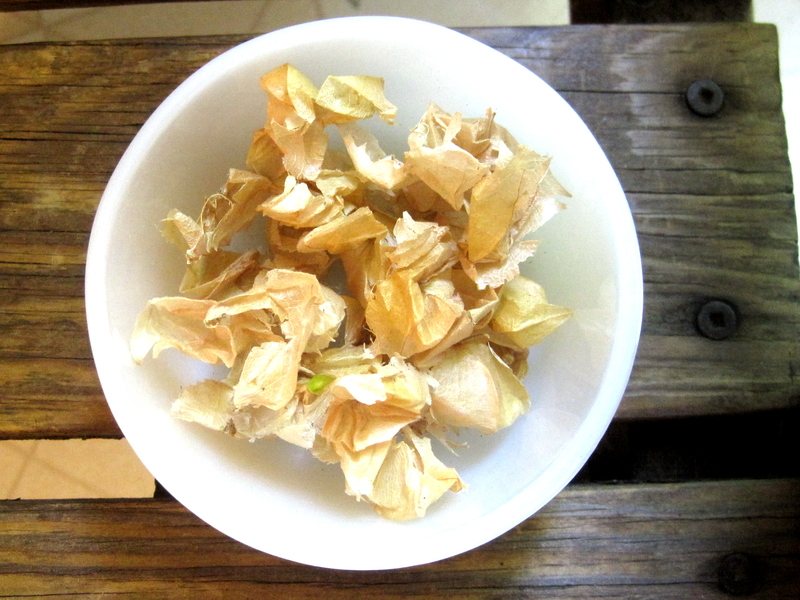 Ground cherry (Cape gooseberry) husks. *In the U.S. you can do this now through September. **To find out of a peach is ripe, press on it very gently with a fingertip. If it gives a bit, pick it. Again, now’s the time, but they’re almost gone. Quick. Hit the orchard. Play hooky. I used to hate avocados. Now I crave them. Who dreams about chicken salad sandwiches with avocado, kosher salt, and fresh garlic, I ask you? Short answer: Me. Long answer: Meeeeeee. Last week I bought two avocados. One went toward the aforementioned chicken salad. 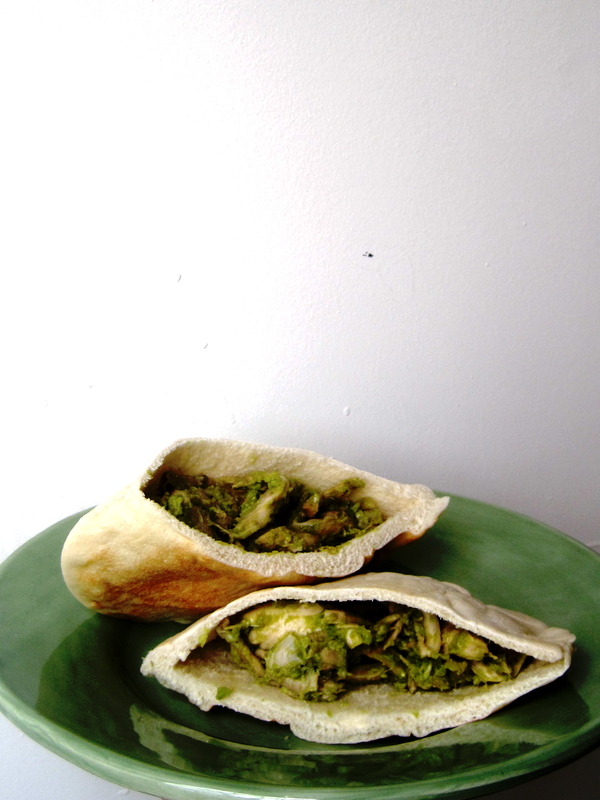 I stuffed it into a really fresh, smooshy pita** and it was incredible. Today I tried a friend of a friend’s idea: avocado smeared on whole-grain bread, with kosher salt and sliced red onion. Also a win. Crunchy sea salt would probably be addictive. **I live in an area with a large Syrian Jewish population, they eat a lot of pita, and they would never put up with the dreck on supermarket shelves. I read that in some communities you don’t dare leave your car unlocked in high summer or you risk finding your backseat packed to the ceiling with your neighbors’ surplus zucchini. Hit-and-run altruism. Or desperation, take your pick. Despite the myriad uses people have come up with to use this prolific squash*, a favorite of mine today was a Sunday morning staple when I grew up, simply called zucchini, onions, and eggs. It’s hardly a recipe, really; like most memorable dishes, it was invented with what happens to be around. Right now in New Jersey it’s this. Slice zucchini into rounds and saute over medium-high heat in a pat of butter or a good drizzle of olive oil. Turn them when you can start to smell them; that’s a sign they’re speckled with brown underneath. Chop up some onion and throw it in with the zucchini, stirring often until it’s lightly browned. Hit the mixture with a little salt. 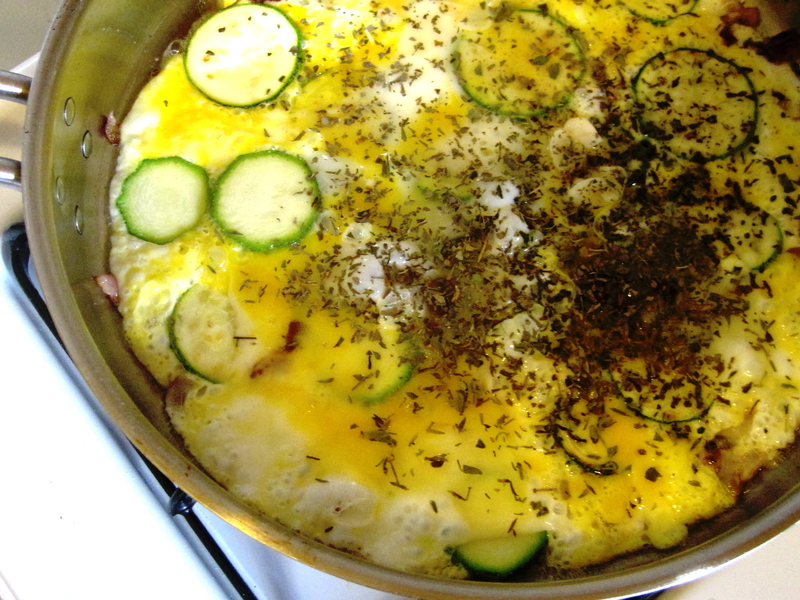 Whisk together some eggs and pour them over the veggies. Add freshly ground pepper and some Italian seasoning, or any variation of fresh or dried basil, thyme, oregano, and rosemary. If you want to get fancy and have good wrist skills, by all means flip that dude over and call it an omelet. Or just stir gently until set through. I like it lightly browned as well. There, you’re done. Wait! I just thought of this—a shaving of Parmigiano-Reggiano or Pecorino Romano would be incredible. ** That’s new. I upped my game with the dish this year by using local ingredients and it was so good: zucchini and ‘candy’ red onion from Silverton Farms in Toms River. 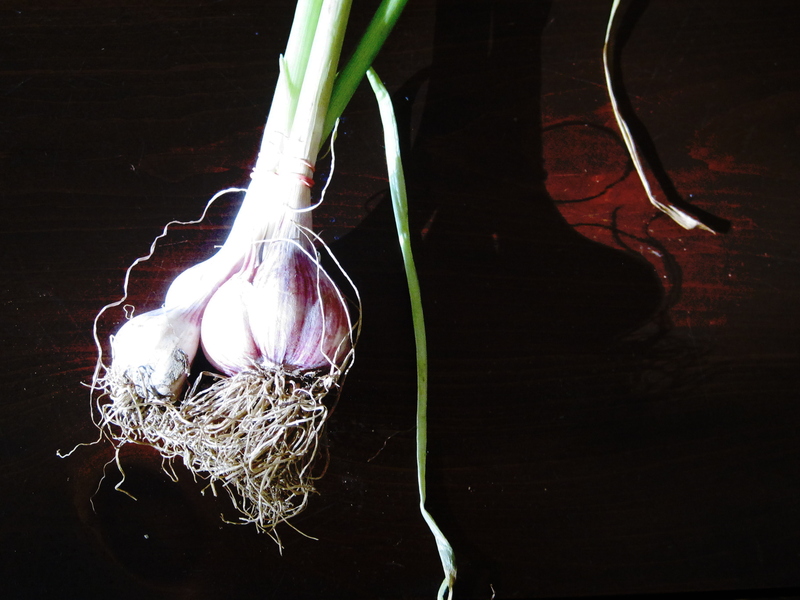 I also sliced in some of their sweet uncured garlic. The eggs were from Wyman Farms, from in county. 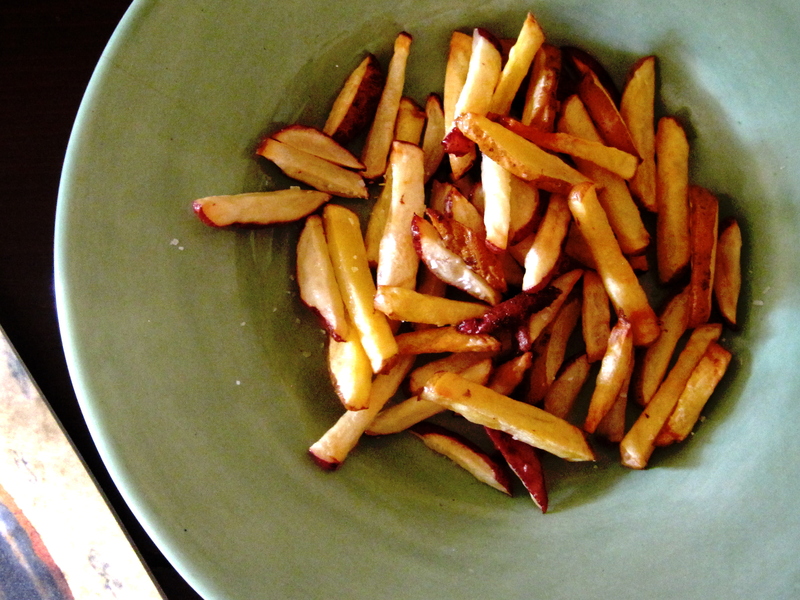 Then I dressed it up even more by making fries with some of the first of Silverton’s itty bitty fresh-dug potatoes, oven roasted with olive oil and tossed with salt. This is breakfast, lunch, or dinner. I don’t have a garden. But if you do, let me know and I’ll leave my car unlocked for you. * I also read people use them as baseball bats—good for precisely one hit, I’m guessing. I need to stop reading so much. **Caveat: if you’re at all tempted to use anything that started in a green can, please disregard entirely the above suggestion.